The Six Bells in St Albans is a great old fashioned traditional pub in the St Michaels area with plenty of character features (built in 16th century) including low exposed beams and a large real fire. It has an excellent selection of real ales that at the time of the visit included Black Sheep, London Pride, Abbott, Deuchars IPA and Adnams. Prices are quite high and £2.90 (June 2007) is typical for the price of a pint. Food is served at tables in all areas of the pub but a seperate dining area is also provided. The food is all home cooked and good quality ranging from burger and chips to top seafood dishes. 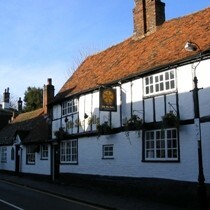 This pub is conveniently located for Verulamium Park and often gets busy without being crowded. It is frequented mainly by middle-aged people but the nice friendly atmosphere makes everyone feel welcome, including the dogs!